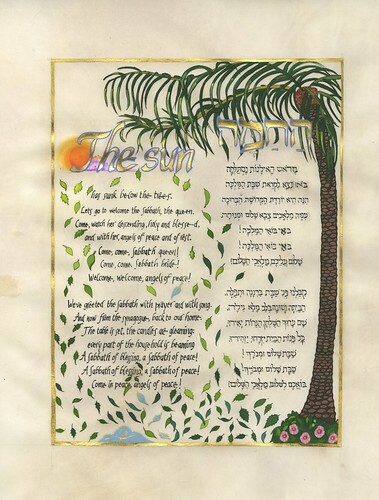 Judaic Ketubot and Artwork by Debra Band – Honeybee in the Garden, LLC » Who is Deborah? Who is Deborah, and Why Do We Read Her Story? 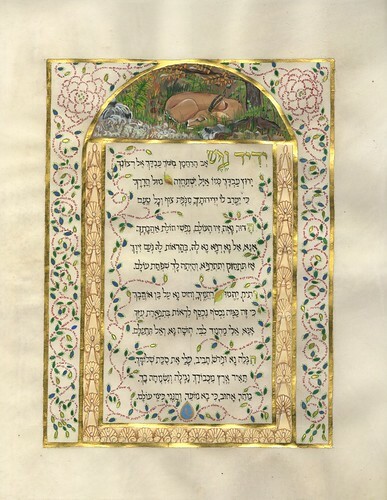 Before immersing ourselves in the illuminations, let us look into the text to discover what we can of the character and circumstances of this unique Israelite woman hero, understand her actions, the place of her story in Jewish ritual, and how she is regarded in the traditional rabbinic sources. Through probing these questions we will come to understand the nature of her heroism, and consequently, how I approach her character within the illuminations. Who is Deborah? 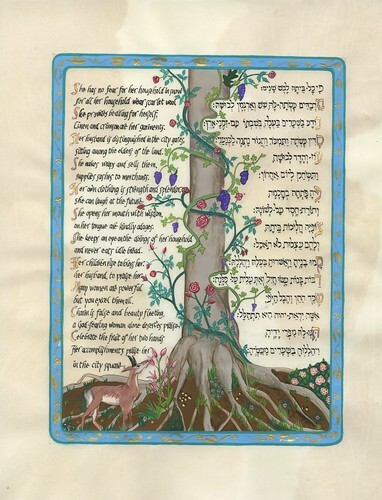 Deborah is the first woman in the Hebrew Bible at the center of a continuous story, including not only a complete narrative, but also an epic poem, a shirah, entirely devoted to her exploits. Whereas the Pentateuch includes copious mentions of Eve, Sarah, Rebecca, Rachel, Leah, and Miriam, none of these archetypal women have sections of text focussed specifically on their deeds – descriptions of their actions are widely dispersed within the tales of the forefathers and Moses. In contrast, two full chapters focus on Deborah’s deeds, and indeed, as Arnold Band shows in his essay, Shirat Devorah is distinguished as one of the earliest texts in the entire Bible. Despite the uniqueness of her character, however, the text provides startlingly few biographical details. She is described as “the woman of Lappidoth,” a formula that invariably indicated marriage; we understand “the wife of Lappidoth.” No character named Lappidoth appears again in the story, but the relationship between the meaning of “lappidoth,” wick, or torch, and the meaning of the name of her general, Barak, lightening, is taken by the rabbinic sources and modern commentators as evidence that Barak and Lappidoth are one and the same, and that Deborah and Barak are in fact husband and wife. We hear nothing about children so her reputation cannot relate to motherhood; while she describes herself as “a mother in Israel” in the shirah, this assertion clearly relates to her national leadership rather than biological motherhood in much the same way that the childless George Washington is described as “father of the nation” in American tradition. Remarkably, it is the woman, Deborah, who receives the gift of prophecy rather than her general husband. Moreover, as Barak asserts, it is her voice rather than his, that can muster the tribes to battle. Her reputation has nothing to do with motherhood, land-holding, household management or success at farming. Rather, quite independently of her husband, she is a shofet, an informal judge, governor or chieftain whose reputation derives from settling disputes among Israelites across, evidently, a wide swathe of tribal territories. Arnold Band notes that of all the shoftim, judges or informal governors, Deborah is the only wholly good and effective leader who is unstained by personal misconduct. We also infer that she is physically fit and able to accompany Barak at leading troops into battle. We are told nothing about her residence in a town, only that she holds court under the “Palm of Deborah.” The midrash compares her to a solid stone house, and consequently I imagine her living a solid life in a such a house, perhaps near a crossroad of some kind within the Israelite lands. Given the breadth of her reputation when the story begins and her physical ability to ride off to war, I surmise that Deborah is probably in healthy, active middle age. She is certainly not some old crone hidden away in a distant mountain-top shrine, far from her people, as for instance Greek oracles – she appears to be an integral part of her local community, with a reputation that commands respect even in the lands of distant tribes spread across the Israelite territory. Deborah is remembered for a triumphant gamble, one daring even with the prophecy of Israel’s rescue from the Canaanites by a woman under her belt. The gamble succeeds, and that triumph seals her importance in the national folk-memory. In brief, the text implies that the Israelite farmers and herders, who lived on the hill-tops (the lowlands tended to be dominated by Canaanites) have complained to her of Canaanite raids. Deborah sends for Barak, telling him of her prophecy that he should fight Sisera at the wadi, the dry-river bed of the Stream of Kishon near Mount Tabor. This is the gamble: at this dawn of the Iron Age, Barak’s relatively rag-tag forces of lightly armed farmers and herders were to draw the technologically superior, iron-reinforced army of Sisera into battle at a river-bed….and hope to prevail. Sisera, however, would have known the terrain, would have realized that if the winter rains had begun his heavy chariots would become mired in a muddy stream-bed; he would have avoided the Kishon. So how could Deborah hope to trap Sisera in a situation where his superior army might be vulnerable to the Barak’s men? Clearly, the moment Deborah chooses for the battle must be at the very beginning of the winter rainy season, when she might take the chance that the first rains might fall, but when Sisera might equally well expect the stream bed to still be dry. And, as we read, with the help of Israel’s providential God Deborah’s gamble pays off; the rains come – indeed all the forces of nature, in the heavens as well as on earth, conspire to bring Deborah and Israel victory. While Sisera escapes the route, he is finished off, unexpectedly and gruesomely, by a female descendant not of Jacob, but of Cain. Deborah’s prophecy that Sisera would be destroyed not by Barak, but by the hand of a woman is thus fulfilled in a most unexpected way. It is the water miracle that has lifted the Deborah story from simple inclusion in Judges to a prominence place in annual Jewish ritual. 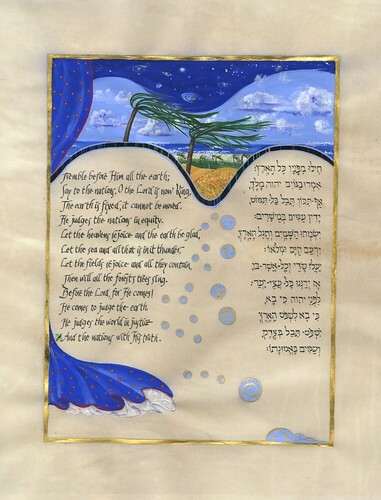 In Ashkenazi tradition the narrative in Chapter 4 and the epic poem, the shirah in Chapter 5 serve together as the haftarah (additional reading) accompanying the Sabbath Torah portion, Beshallakh (Exodus 13:17-17:16), the account of the most magnificent of the water miracles, the Crossing of the Red Sea. 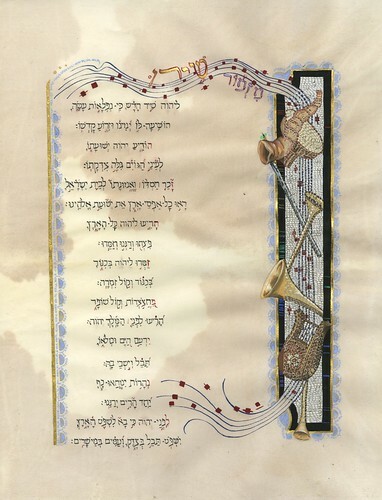 In Sephardic tradition Shirat Devorah alone is chanted as the haftarah. 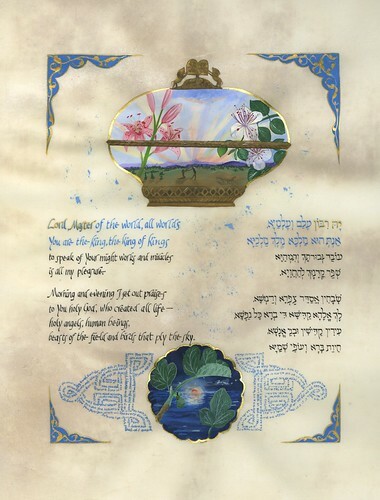 Given the eminence of the events of Beshallakh, considered by rabbinic authorities such as Rabbi Akiva as the formative moment of the Israelite nation, the moment when the love between Israel and its God was first declared, granting Shirat Devorah the signal honor of being its haftarah testifies to the importance with which the story was held. 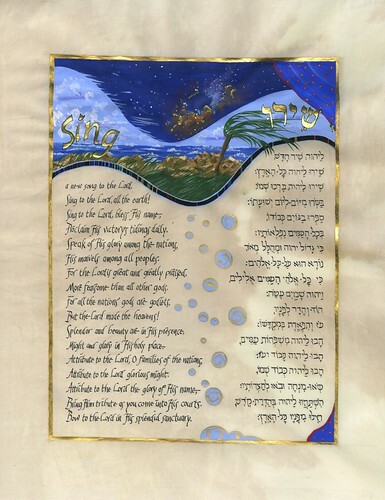 In the Targum, or Aramaic paraphrase, of the Song of Songs, Shirat Devorah numbers among the ten great songs to be sung during the course of pre-Messianic history. Hence, where I find that the rabbinic discussions actually add to our understanding of the story, I certainly work with them. 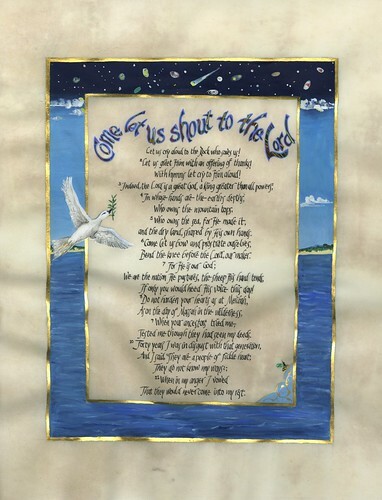 However, by and large my visual interpretation relies primarily on a close reading of the biblical text itself. As I have written in my Introduction to this work, the close reading of the text is complemented by a variety of other interpretative elements, including, among others, an appreciation of the era’s material culture derived from the archeology of the period, from an appreciation of the centrality of the agrarian nature of the community, and as keen as possible an awareness of the emotions within the story. 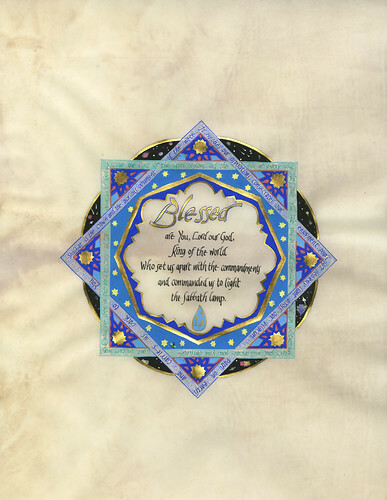 Deborah’s heroic reputation springs from the people’s trust in her wisdom as an arbiter and leader over an apparent period of years, her gift of prophecy, and the sheer gutsiness of her gamble at Wadi Kishon. Whether through luck or divine intervention, her courage won the Israelites “forty years” of relief from trouble with the Canaanites, and she constructs her own legend in the shirah. It is important to note here that Deborah is not a larger-than-life figure dropped to earth by an eagle, or found in a basket in a river, or who is produced through any other miraculous event. Rather, she is of her people, lives directly among them, and while God grants her the special gift of prophecy, she was evidently already exercising straightforward commonsense and good judgment in solving daily problems. She arrives at her heroism through courageous implementation of her prophecy, with the cooperation of tribes whose experience leads them to trust her judgment and actions. It is this kind of heroism, grounded in the agrarian Israelite tribal culture with its attachment to the providential God that I attempt to capture in the paintings that you find here.